The shortcomings of 17th Century French philsophers aside, when it comes to your wedding day, chances are your guests will too be drinking tea. Or coffee. Or some hot beverage that will momentarily distract from wine. In a hunt that can go no further than one find, one clever company has turned tea into opportuni-tea. 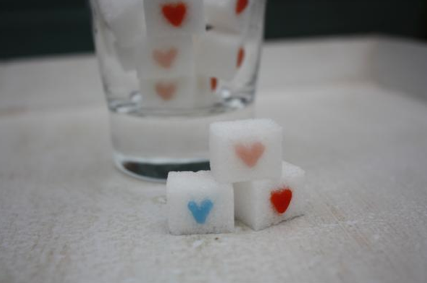 For your guests who aren’t sweet enough already (my favourite response to if I want sugar in my tea), instead of bog standard sugar cubes, stack up some cute hand decorated ones, finished with blue, pink or red hearts. A nice idea via Big Little Things. Have you seen any other little finishing touches for weddings? Your comments are always welcomed below.